While the US constantly lectures other countries on human rights, Trump will not raise the subject on his visit to Saudi Arabia, which has one of the worst human rights records, analysts told RT. Arms sales are key to all of this, they added. Prior to Donald Trump’s first foreign trip as president, RT spoke to author and investigative journalist Max Blumenthal and discussed Trump’s long-standing ties to Saudi Arabia, the implications of the unprecedented $100-billion arms deal, and the impact of this visit on US policy. Max Blumenthal: Trump, during the campaign, blamed Saudi Arabia – and, I would argue, somewhat correctly – for playing a role in the 9/11 attacks, the greatest terrorist attack on American soil. At the same time, he was inking – while on the campaign trail – he was inking deals with eight hotel interests in Saudi Arabia to deepen his business ties. I mean hotels, casinos – a lot of it has to do with money laundering and Trump is really a master of that. The Gulf States have these great sovereign wealth funds, and Trump and Jared Kushner, his son-in-law, want to tap into those. So, the ties are deep between Trump and the Saudis, far deeper than other foreign countries which we hear a lot about. RT: That took a lot of guts then for him to bad-mouth them out of one side of his mouth, and then broker deals out of the other side. MB: His supporters didn’t seem to care and they still don’t seem to care, and neither does the liberal resistance. This trip doesn’t raise the same amount of alarm that Trump receiving Philippines leader Duterte did. I find that interesting because here we have another authoritarian leader, Prince Salman, who Trump is going to meet with and overlook any human rights abuses within the kingdom. 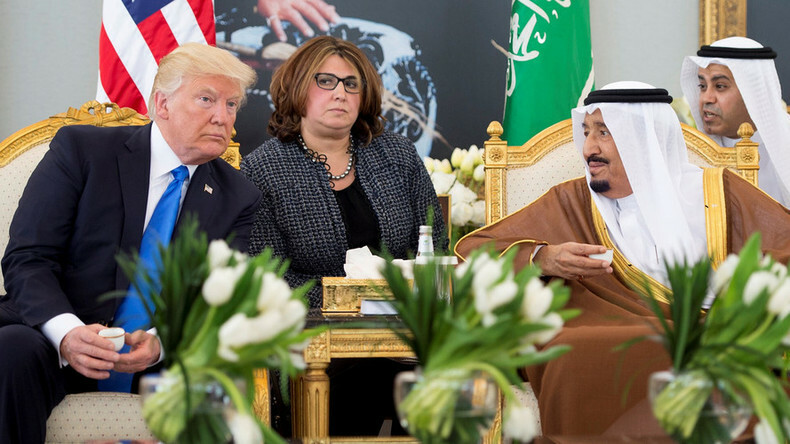 MB: This is bipartisan consensus that this is A-OK.
— Donald J. Trump (@realDonaldTrump) 19 мая 2017 г.
RT: Human rights groups though have expressed concerns that that Trump won’t raise the issue of human rights abuses with King Salman. How do you think this particular visit will influence US policy in terms of how Saudi Arabia is interacting in Yemen and Syria? MB: Saudi Arabia has always been key to imperial interests in the Middle East going back to the high colonial days of the British Empire, and now the American Empire sees Saudi Arabia as its bulwark, supporting Israel’s advancing hostility to Iran and Yemen and abroad. And weapon sales are key to all of this. You can talk about the internal human rights abuses, the fact that Waleed Abulkhair, the Saudi human rights lawyer, has been jailed for 15 years; Ali Al Nimr, the son of the executed cleric, is in jail; Raif Badawi, the Saudi atheist, is in jail; women are not allowed to drive; the treatment of foreign workers – Trump is not going to bring these aspects up. Then you have Saudi Arabia’s pulverization of Yemen, where civilians are being treated like protesters outside of the Turkish ambassador’s residence by Erdogan’s bodyguards. It is just getting absolutely pulverized. We saw a report yesterday that Jared Kushner, Trump's son-in-law, actually called Lockheed Martin to ask them to give Saudi Arabia a bargain-basement deal on this $100 billion arms transfer which may represent the largest arms deal in American history and that those weapons are going to be used against Yemeni civilians in a country which really represents the world’s worst humanitarian crisis. “Obviously, the relationship between Saudi Arabia and the US has always been centered around Saudi Arabia’s vast oil wealth of approximately 40 billion barrels of proven reserves. It is still the world’s largest oil producing country… It has to do with oil, it has to do with arms sales. And you have to wonder if there are personal business reasons for Trump to be doing business in Saudi Arabia: hotels and so on. It is all possible, money obviously ties into it,” he told RT. “Every president does it: Democrat, Republican, Obama, George W. Bush, Bill Clinton, they all do it, they’ve done it since the 1950s. There is nothing new here. This is just the continuation of a relationship that is particularly sordid given the fact that the US is constantly lecturing other countries about human rights and Saudi Arabia is pretty much one of the worst countries on the planet when it comes to human rights,” Rall said.